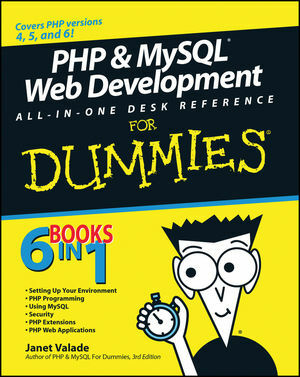 Janet Valade is the author of PHP &MySQL For Dummies, which is in its third edition. She has also written PHP & MySQL Everyday Apps For Dummies and PHP & MySQL: Your visual blueprint for creating dynamic, database-driven Web sites. In addition, Janet is the author of Spring into Linux and a co-author of Mastering Visually Dreamweaver CS3 and Flash CS3 Professional. Janet has 20 years of experience in the computing field. Most recently, she worked as a Web designer and programmer in an engineering firm for four years. Prior to that, Janet worked for 13 years in a university environment, where she was a systems analyst. During her tenure, she supervised the installation and operation of computing resources, designed and developed a data archive, supported faculty and students in their computer usage, wrote numerous technical papers, and developed and presented seminars on a variety of technology topics. Book I: Setting Up Your Environment. Chapter 1: Setting Up Your Web Environment. Chapter 3: Setting Up the MySQL Environment. Chapter 4: Installing a Web Server. Chapter 5: Setting Up Your Web Development Environment with the XAMPP Package. Chapter 2: Building PHP Scripts. Chapter 3: PHP and Your Operating System. Chapter 3: Designing and Building a Database. Chapter 4: Using the Database. Chapter 5: Communicating with the Database from PHP Scripts. Chapter 1: General Security Considerations. Chapter 2: An Overview of Authentication and Encryption. Chapter 3: Creating a Secure Environment. Chapter 4: Programming Securely in PHP. Chapter 5: Programming Secure E-Commerce Applications. Chapter 1: Introduction to Extensions. Chapter 3: Using the XML Extension. Chapter 4: Manipulating Images with the GD Extension. Book VI: PHP Web Applications. Chapter 1: Building and Processing Dynamic Forms. Chapter 2: Making Information Available on Multiple Web Pages. Chapter 3: Building a Login Application. Chapter 4: Building an Online Catalog. Chapter 5: Building a Shopping Cart. The code examples for this title are stored in a ZIP archive. To open it, you will need a computer with software capable of opening ZIP files. If you do not already have this capability, you can download a free trial of WinZip.